Combined oral contraceptives are one of the risk factor for stroke in women. Published in the Journal of Mid-life Health, the authors report a case of an arterial ischemic stroke due to lacunar infarction in a 35-year-old previously healthy female patient induced after 3 years on 'Sukhi', an oral contraceptive after two times artificial abortions. A 35-year-old female patient on 'Sukhi' for contraception for the last 3 years presented to the Emergency Department with complaints of sudden onset (45 min earlier) of slight paralysis of the right side of her body and the inability to express herself by speech, writing, or signs. She was afebrile, alert, oriented with blood pressure of 122/98 mm Hg, pulse rate 100/min. She was a non-smoker, not a known diabetic or hypertensive, but there was history of repeated abortions in the past. General physical examination was normal with normal intact memory. Fundoscopic findings were normal although neurological examination revealed right sided hemiparesis with upward right babinski reflex. On investigations the parameters such as hemogram, ESR, random blood sugar, kidney function tests, liver function tests, electroencephalogram, electrocardiogram, serum cholesterol, serum electrolytes, urine analysis and X-ray chest were within normal limits. Plasma amino acid, vascular profile, and metabolic profile &#40;including levels of homocysteine, ammonia, and lactate&#41; were also within normal limits. Hemoglobin electrophoresis also revealed normal bands. Additional tests such as prothrombin time, activated partial thromboplastin time, antinuclear antibody test, anticardiolipin antibody immunoglobulin levels, protein C level and antithrombin III level were within normal limits. 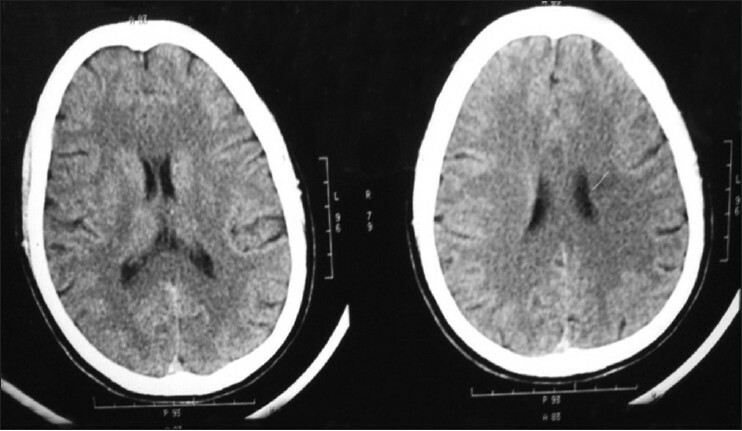 However a non-contrast enhanced computed tomography of brain showed a LACI which was confirmed on a magnetic resonance imaging scan. The patient was then hospitalized and treated with intravenous unfractionated heparin, which was then switched on to subcutaneous enoxaparin. After 7 days, her condition completely improved and she was discharged with oral warfarin.